Effect: A group of children that you did a show for have made you a unique and special gift as a thank you. Wonderful though this is, it's not a lot of use for performing with. So using your special powers you set about changing one card, then the whole deck into a more familiar and useful design. 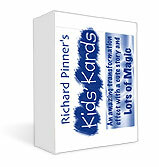 Each Kids Kards deck comes complete and ready to work. As you can see from the images, the artwork on the "kid" cards is charming - both the faces and backs have been custom printed and are perfectly in tune with the patter story of children designing a deck of cards. The trick is nearly self-working, the deck does all the work for you.